Ever thought that you would meet a person who has a passion, zeal and a warm personality, then look no further, her name is Cate Broussard all the way from New Orleans, Louisiana, USA. When Cate was back in the US she thought of doing her internship program in Kenya. Through her friend Johannes, who previously volunteered with us, she was able to connect to SNA-K. It seemed luck was on her side since Sisi Ni Amani was looking for a specialist with her kind of monitoring and evaluation skills. Talk of being born with a silver spoon. She emailed Rachel Brown (Sisi ni Amani CEO) and within two hours the deal was sealed and she had plans to report in Nairobi, Kenya. Cate has many interests, but has a passion for peace building, which out does all the other interests she has. She has a record of working and interacting with people of different nations. Having been to more than ten countries at a tender age, it’s just amazing what she does and how she does it. Having interacted with different nationalities, Cate found out the main or the core in our lives is to live in a peaceful environment and this cannot be achieved by people fighting and killing each other. It can only be achieved by preaching and spreading peace. Cate talked of how she is proud of the SNA-K SMS platform which is one of the major assets or resource for bridging peace in Kenya and all over the world. Cate, with her vast experience, gave thumbs up to Sisi ni Amani for having the best resources on board, for example she praised the SNA-K staff. She was just amazed by how these people are committed to what they do; she had no option but look forward to each day with a smile on her face. Cate noted that in order to understand whether SNA-K’s programs are having their intended impact, there is the need to set up structures for documentation and analysis. There will be a lot of documentation that needs to be done and also a lot of training in the two chapters (Nairobi and Narok), to give them the skills for documentation and analysis. She emphasizes that there is a lot of potential in SNA-K, and especially in the two chapters. Cate happiest moment is when she shared her vast knowledge with Caleb Njoroge. She couldn’t stop smiling and being happy, she has been amazed how Caleb grasped each concept and he expounded on it. She mentioned that Caleb is one of SNA’s numerous talents and a major asset for the future. Cate has been into many countries but she told me Kenya is special and she is positive she is coming back. In the meantime she goes back to the U.S. to finish her Masters in International Peace and Conflict Resolution at American University. She will be continuing her work with Sisi ni Amani from there as she will continue to develop tools that will be used in SNA in the near future. Recently, you’ve probably been noticing blog posts from ‘shiksmuhuri’ and ‘mainageorge.’ They are SNA-K’s two new interns, Mercy and George, who will be updating the blog weekly with posts about SNA-K’s activities, programs, and stories about our members. Mercy Wanjiku Muhuri: I am individualistic, a humanitarian, clever, unpredictable and freedom loving. I’m a peace lover among many other things, and that’s why Sisi ni Amani was perfect fit for me. I love the whole idea behind it, I get to interact with different people all the time, and I get to have a one on one experience with people from different communities and to listen to their ideas. It makes me realise that I am only a small element in this huge world. I hope to learn as much as I can in my time with Sisi ni Amani, and to have fun doing it. I’m already so humbled by how good everyone is. I will be writing a blog about the Narok chapter, meetings, activities and experiences, as well as the PeaceTXT Program. I am looking forward to making it as interesting as possible and for all of our supporters. I look forward to the results that will come from all the hard work that everyone involved is putting into this. 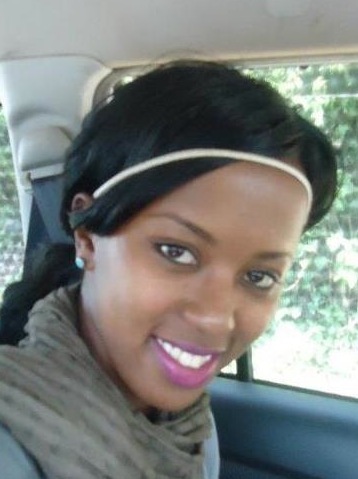 Mercy has a Bachelors in Business Management, and a Certificate in Airline Cabin Crew with Kenya Airways. She has previously worked as a Marketing Assistant at Farmers Choice Ltd, and Customer Service at Kenya Airways. While studying for her Certificate with Kenya Airways, Mercy co-initiated a program where The Pride Center trainers helped raise funds for a children’s home as part of their CSR activities. George Maina:I am a self driven person and a holder of Bachelor of Business Administration in Finance and accounting option. I am dedicated to serve people and to work with driven teams. I love working to guide, motivate and encourage team members through team building services. During my studies at Kenya Methodist University, I was the president of the University’s Peace Council, a peace club that provided students with experiences and active work in peace promotion. At one point, I organized a tree planting event that gained the partnership of Wangari Maathai’s organization. 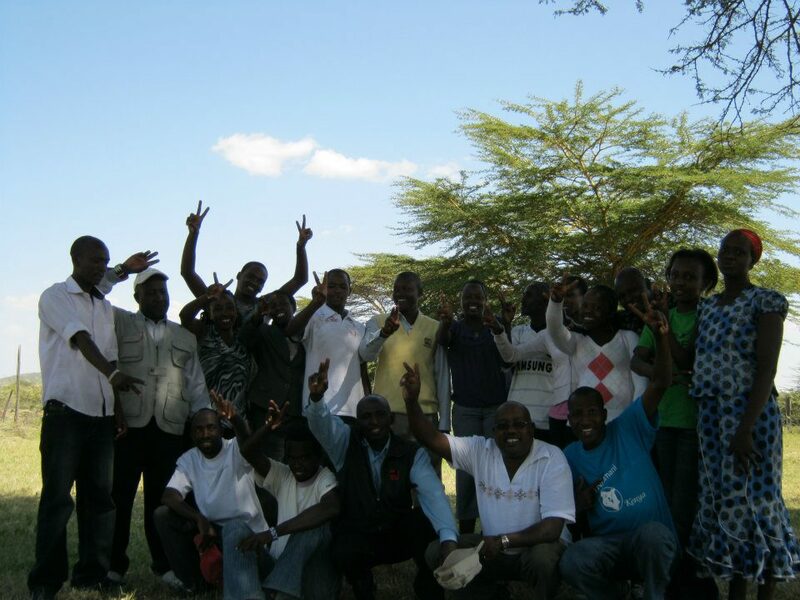 The SNA-K Narok Team, Transmara Representatives, and Nairobi staff met in Narok Town, and boarded a matatu. 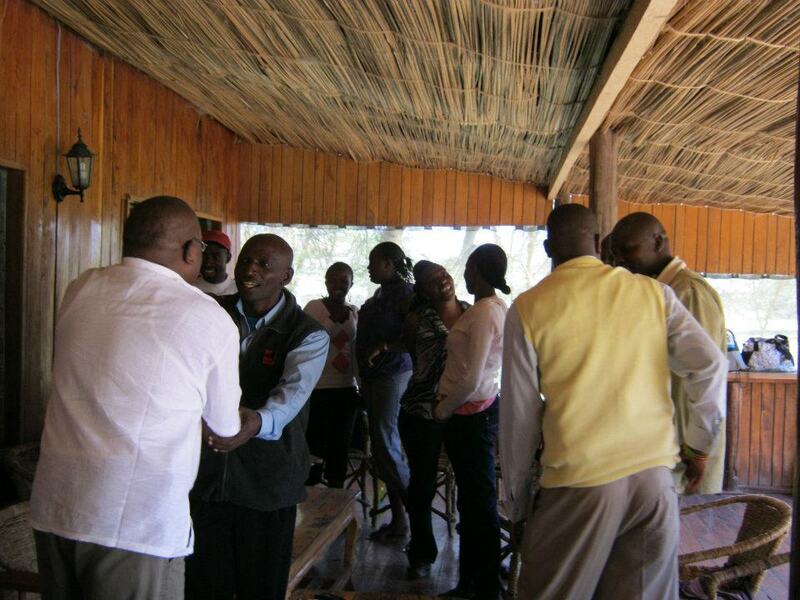 The team travelled together to Ilariak grounds, an campground on the way to the Maasai Mara. The first session was led by Narok’s DPC (District Peace Commissioner), Joseph Pareiyio, and the members got to introduce themselves so as to get acquainted with each other. After the introductions, members got to chat over a cup of tea. The second session was part briefing and part training. Jackie briefed the team on SNA-K’s activities and outlined the roles of the volunteers and how they are expected to conduct themselves during the outreach and events by SNA-K.
After a short break, Mr. Pareiyio concluded the morning session by speaking about communication and the role it plays in any organization and in any team. He noted that communication is the fabric that sustains and maintains any successful team and without it chaos ensues. The team played several games and looked at several examples about how to ensure effective communication, and the potential impacts of ineffective communication within a team. After the session with Mr.Pareiyio, the team from Transmara was asked to pin point the volatile areas that they thought would benefit from SNA-K’s work. Various hotspots were noted and the reasons for conflict in those hot spots were discussed so as to understand root causes of conflict and the areas in which SNA-K’s approach could be most effective. The team broke for lunch and was able to bond some more over the lunch session, since eating together is also a form of bonding. After lunch the afternoon session involved games and team sports. The games were to show the members how well they know each other and how well they can function as a team under pressure. It was fun and exciting as members competed against each other in different teams. 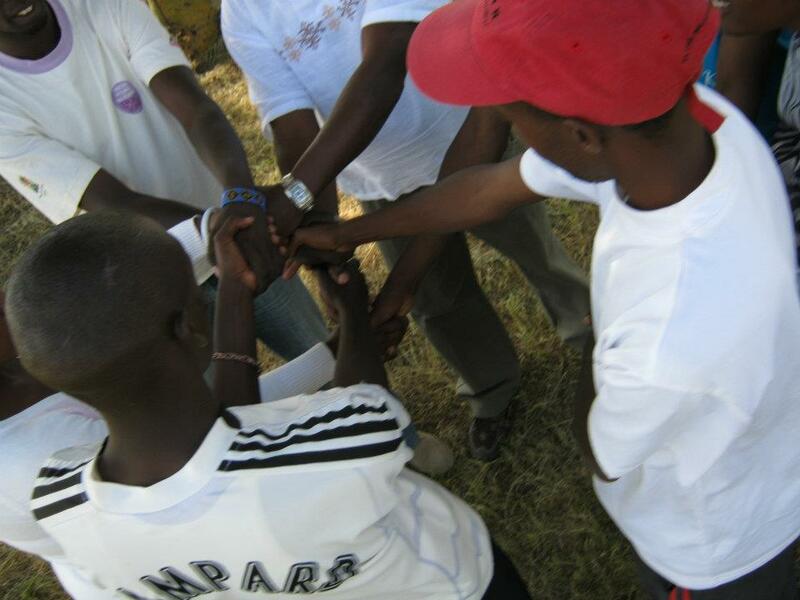 Members learned how to work with each other to achieve great results in the games. The games centered on communication and trust. Volunteers work to untangle their "human knot." Communication is key! The games and sports session concluded the day’s main activities as the team broke off to have a cup of evening tea. The team was excited about spending time together, and even began to propose and plan a team camping trip. The day had been successful from the beginning and the members were all delighted to have attended and learned all about teambuilding. Members said that they were fully equipped to conduct the upcoming events and outreaches. Teamwork is the key to any successful organization because it carries with it the elements of success. Mr. Pareiyio explained to the members that for peace to be sustained in the country, the people of Kenya must work together and working together is another term for teamwork. Kenya is made up of 43 different tribes that have different cultures and practices. This makes it hard to come to an understanding, especially when utilization of natural resources come into play e.g. rivers, land, springs etc. This, however, could be solved if the parties involved came together and worked together to reach a solution because two heads are better than one and different tribes coming together to solve a problem makes it much easier to reach a solution than when they try solving a problem as two separate groups. A team is made up of different people and this was shown clearly from the introductions that were made. Mr. Pareiyio made us realize that as much as we are working together, we are all different people with different names, characteristics, interests, ages etc. These differences are very important in a functioning team because in a winning team you will find everyone has a different set of skills that he/she uses to the best of their abilities to enable the team to function well. If all the people/members of a team had the same set of skills and no diversity, the team would be limited to only what these people know. Diversity of people and their backgrounds makes the team more flexible and diverse, giving it the ability to handle different tasks and solve multiple problems effectively. Spreading peace and maintaining peace involve the very essence of teamwork because when there is no teamwork in any group or society then peace is threatened since everyone does what they think is best for themselves and are thus likely to offend others and destroy any peace building that might be going on. A winning team, or a successful team, teaches others who observe it so many things. One need not to explain to people what the team is doing right because it’s clearly visible when a group of individuals come together and work in synch – the results can be huge. This is to say that before we preach peace, we must be at peace with each other so that we can function as a team even when we are in different areas. Another critical area in teamwork that was mentioned was open and clear communication. This was stated as the glue or the fiber that holds a team together and keeps it from falling apart. Members who share openly with each other about different aspects of the team are able to encourage each other to achieve any set goals. Hiding or not addressing any issues concerning the team only serves to damage the relationship of the team members which in turn ends up crippling the team because someone might have a solution to a problem but isn’t comfortable enough to share it due to one reason or the other. Working as a team has many benefits, and as peacemakers, the number one benefit for us is to spread peace and maintain peace, as this is our goal. Different cultures, races, tribes, personalities, genders and age groups working together on a common goal, translates to teamwork which in turn for us translates into peace. Security is Nairobi is difficult to quantify. Crime comes in all forms on every socioeconomic level. We can’t label a single source of crime or plan out just one cure-all solution. We can’t discuss the issue of security in Nairobi without discussing community policing. In this city of informality, private community groups must fill the gaps left by government police. Recently, Sisi ni Amani sent an SMS to the Baba Dogo and Korogocho communities asking about ways to improve security. The most popular response was increased community patrolling. I’m tentative to agree. In fact, community policing is hurting communities more than helping them. Accountability for vigilante groups is nonexistent. They don’t need to answer to the government or official police. Many consider themselves equal to such official policemen. They go overboard, getting excessively involved in domestic issues and committing caning and flogging. These men add to the violence rather than reduce it. Even when community patrols are doing their work, there are cases of mistaken identity. Sadly, too many innocent individuals have died at the hands of these vigilantes. Without a set of standards for who they recruit, vigilante groups often devolve into gangs of youth, going door to door, collecting fifty bob to offer protection that doesn’t come through. Where the Kasarani chapter of SnA is located in Baba Dogo’s ACREF, we were asked by a group to pay 500 shillings a month for protection. We paid it for a while but ACREF was broken into a few months ago and robbed. Next time they came to collect, we asked those guys for some accountability, telling them, “If you want our money then we need a contract.” They refused so we refused to pay them. Why should we pay if they won’t follow through? We do have a good rapport with the neighbors around. They’re willing to let us know what’s going on, what’s safe and what’s not. It’s a different kind of community policing, based in solidarity and mutual trust. If the community can be their brother’s keeper then we won’t need other people to take care of us. Both the government and community police are part of a system that cannot deal with criminals effectively. When so many suspects are released, most likely because criminals are well connected and most can pay a bribe, the community suffers. Often the official and unofficial police kill suspected criminals. They see it as their own personal criminal justice. I see why they do this but I cannot justify it. We can’t condone the killing of our fellow human being, especially when, all too often, the wrong man is killed. People love to talk about the cause of crime in Nairobi. Many blame it on the lack of employment, drug problems, or instability but ultimately it comes down to ignorance. Being broke doesn’t justify killing someone or stealing. It comes down to educating people not only on their options to build a better life, but also on morality. Sometimes the lessons just need to be forced into people’s psyche. An educated community is the foundation for a secure community. People do not bring peace to other people; people make peace wherever they are. The training was conducted by ACORD (Agency for co-operation and research development), with the aid of NSC (National Steering Committee) on peace building and conflict management and UNDP-Kenya (United Nations Development Program). It targeted he whole of Nairobi County with each and every district represented, largely with district peace committee members. ACORD has experience of over 30 years working in conflict and conflict in Africa. It has been working in conflict areas such as; Angola, Burundi, Chad, the DR of Congo (DRC), Eritrea, Ethiopia, Guinea Conakry, Kenya, Mozambique, Rwanda, Somalia, Sudan and Uganda. The training was aimed at giving the peace leaders more experience and more exposure to help them carryout their day to day of peace activities, without any hindrance and to build capacity of the already existing peace organizations/groups to quell the already existing animosity among the communities, that might make this county and country as a whole go back to its past status (post election violence 2007/20080) and make people know and understand the importance of peace. This training was aimed at making people know deeply about others cultures and values so that we celebrate our cultures and values in diverse manners for the sake of co existence. After the conclusion of the T.O.T’s training, the participants are to go on and teach others about all these so that peace can have a large base in the community. It was recommended that the district peace committees work hand in hand with other existing organizations that promote the same gospel so that this process can be owned by the community. Peace is not a destination but a process that makes people live in peace and harmony, celebrate and embrace each other. The Nairobi Provincial Commissioner, who officially opened the training, recommended that any constituency that has any peace activity and has no support can contact him as he has some money from the Ministry of Special Programs that can be used to conduct peace activities. The Provincial Commissioner is the chairman of the Nairobi Peace Committee. This T.O.T umbrella will be making program exchanges from one district to another.